UN-Habitat Sri Lanka | Second Set of Houses Constructed through the Indian Housing Project Handed Over to Estate Families in Nuwara Eliya. UN-Habitat Sri Lanka > News > Indian Housing Project in Central and Uva Provinces News > Second Set of Houses Constructed through the Indian Housing Project Handed Over to Estate Families in Nuwara Eliya. 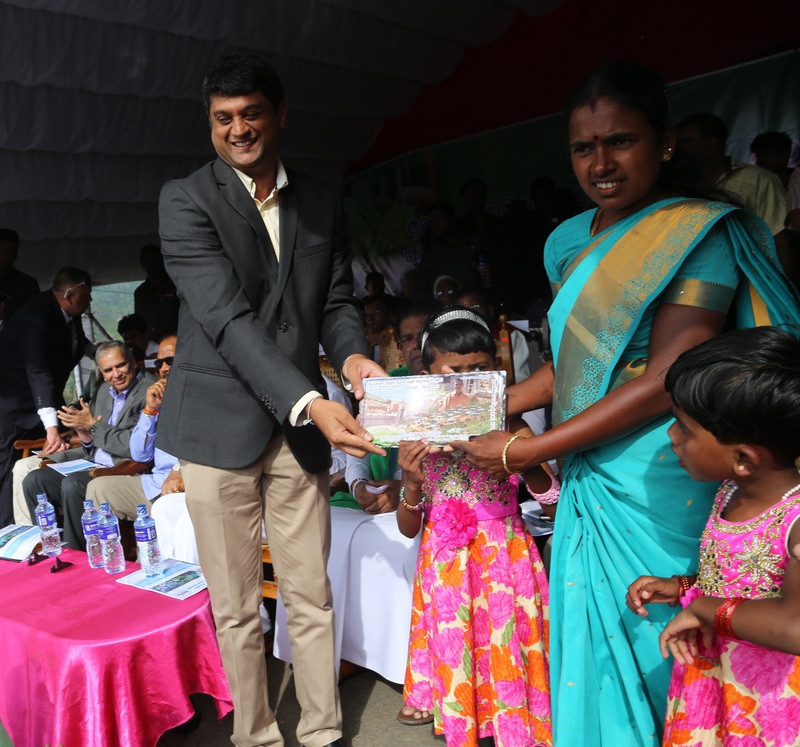 20 January 2019, Nuwara Eliya, Sri Lanka: Today, 150 estate families in Nuwara Eliya were provided with the title deeds to their newly constructed houses funded by the Indian Housing Project in Plantation Areas. The title deeds were handed over to the families by the Minister of Lands and Parliamentary Reforms, Hon. Gayantha Karunathileke, and the Minister for Hill country New Villages, Infrastructure and Community Development, Hon. Palani Digambaram at a special event at Diyagama west estate in Agarapatna. This project is implemented by the United Nations Human Settlements Programme (UN-Habitat), through a participatory, home owner driven process in partnership with the Government of Sri Lanka and Diygama West Estate Worker Housing Cooperative Society (EWHCS) with funding from the Government of India. The Deputy High Commissioner of India to Sri Lanka, H.E. Dr. Shilpak N. Ambule, as well as several senior Ministers and Members of Parliament from the Government of Sri Lanka participated at the hand over ceremony. 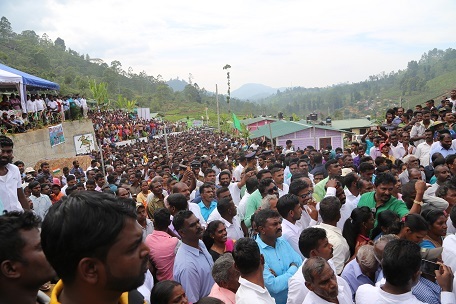 The event was well attended by over 3,000 people, including members of provincial councils and local authorities, senior Government officials, officials from the Plantation Human Development Trust, Agarapatana Plantation Company and UN-Habitat and a large number of community members from Diyagama West Estate. Addressing the gathering, Hon. Gayantha Karunathilake appreciated India’s commitment to partner with Sri Lanka in development projects including the construction of houses for plantation workers. He also emphasized the steps taken by the government to provide land ownership for the estate community. The Deputy High Commissioner congratulated the proud owners of the newly built houses. He mentioned that the Indian Housing Project in Sri Lanka with a grant of over US$ 350 million was the largest Indian grant assistance project overseas. Several homeowners as well as construction workers who had contributed positively towards the project were recognized at this event with special awards. These included awards for masonry and quality assurance in construction, organic home gardening, sustainable land use including incorporation of Disaster Risk Reduction (DRR) measures and entrepreneurship. Awards and certificates were also handed over to school children who participated in a wall art competition conducted jointly by UN-Habitat and the Diyagama West EWHCS. The overall Indian Housing Project which commenced in the plantation areas in 2016, involves the construction of a total of 14,000 houses for estate workers. UN-Habitat is one of four implementing agencies of the project, currently constructing 1,600 houses in the districts of Nuwara Eliya, Badulla and Kandy, of which 398 houses have been already completed.